RedActiva is an initiative of the Center for Public Policies and the School of Design of the Pontificia Universidad Católica de Chile, in partnership with the Retirement Fund Administrators Association. 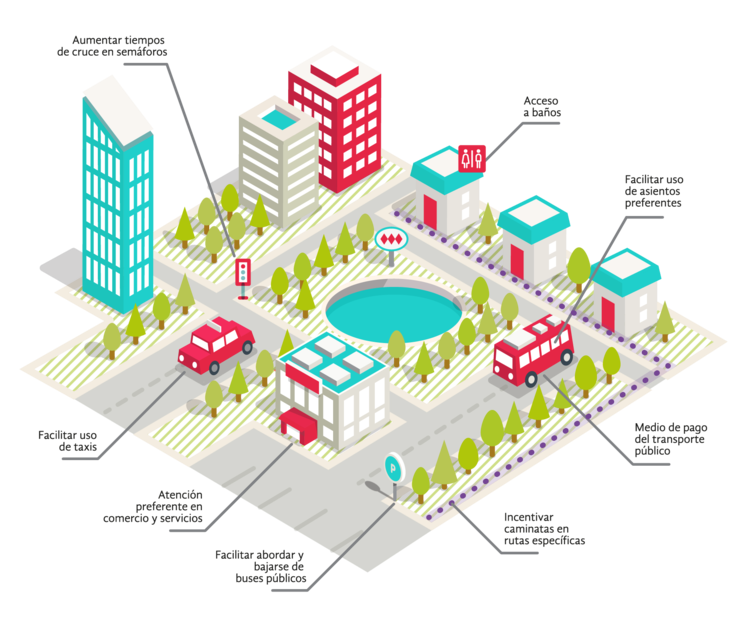 It is developed by the Public Innovation Laboratory and has the support of the NGO “Fundación Oportunidad Mayor”. RedActiva is a public-private partnership open to the incorporation of new actors that promote the autonomy and independence of the elderly. As of March 2018, a RedActiva pilot indicative is being held with the Municipality of Puente Alto. This pilot has taken place in the center of the borough. Thanks to the support of the Municipality of Puente Alto; the city’s Unit of Traffic Control; the taxi drivers union; the technology company AUTER and various shops and commercial establishments, part of the RedActiva functionalities were implemented in the center of the borough. On crowded pedestrian crossings, sensors were installed in traffic lights in order to grant a greater time for the green light when required by the elderly. This function is activated when the Active Band connects with the totem poles. The Active Route has totem poles that record the distance traveled when connecting the Active Band to these poles. The distance travelled converts into reward points that may be exchanged for prizes or benefits, encouraging the elderly to walk more frequently. By bringing the Active Band close to the readers inside the buses, an alert will be activated giving notice that an elder wants to get off. The driver will bring the bus close to the sidewalk, facilitating the descent and stopping the time needed for that. By showing their Active Band, the elderly will have free access to different restrooms that support RedActiva. These restrooms will be identified because RedActiva logo will be outside of each facility. The shops that have an agreement with RedActiva will offer benefits and special deals for the users of the Active Band. These shops can be identified because RedActiva logo will be outside of each shop. We all have to sometimes go to establishments to execute different types of bureaucratic procedures and must wait in a long queue before being attended. The elderly will be able to shorten the waiting time and will receive preferential assistance on the establishments that support RedActiva. By bringing the Active Band closer to the reader at the RedActiva taxi stops, a request will be sent to the transport platform with the location of the elder and thus the company will be able to notify via SMS that the vehicle is on its way. Bus stops will include a system that will alert drivers that elder person is waiting, encouraging the bus to get as close as possible to the sidewalk to facilitate access to it. There will be a system installed both on the subway and on the busses that, once an Active Band is brought close to the reader, this will alert passengers who are seated in preferential seats that an elder person needs that seat. It will be able to use the Active Band as an electronic payment for public transport, integrated with the traditional transportation card. The Active Band is the key to access the benefits of RedActiva. By carrying it, the user can access different services, deals and discounts especially designed for the elderly.